Houston, TX (April 9, 2019) – Jacksonville, FL, has been selected as a top retirement destination by Where to Retire, the only magazine in America geared toward helping people with retirement relocation decisions. 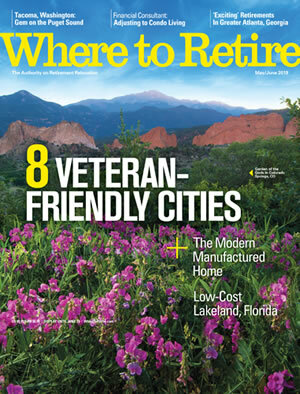 Jacksonville is profiled in a feature titled “8 Veteran-Friendly Cities” in the May/June 2019 issue, available nationwide now. According to the latest data from the U.S. Census Bureau, more than 700,000 Americans relocate to new towns in retirement each year. Generally, these relocating retirees are healthier, better educated and more affluent than those who choose to not relocate, and they bring significant economic benefits to their new states and hometowns. Florida continues to reign as the No. 1 destination for retirement relocation, followed by Arizona, South Carolina and North Carolina. The most popular region is the Southeast, claiming eight of the 17 states showing increases in total net retiree migration. This research and the latest census data is detailed in Where to Retire’s four-part series on retirement relocation. Order these back issues online. Request a free trial issue at WhereToRetire.com. 8 Veteran-Friendly Cities: Albuquerque, NM; Bossier City, LA; Colorado Springs, CO; Columbus, GA; Dothan, AL; Jacksonville, FL; Virginia Beach, VA; and Yuma, AZ.